Cozy Up to Lucky Puppy Bingo | Coming Soon for 2016! Lord Bingo News Bingo Promotions Cozy Up to Lucky Puppy Bingo! Coming Soon! Cozy Up to Lucky Puppy Bingo! Coming Soon! Soon you can cozy up to Lucky Puppy Bingo, the luckiest newest bingo site for 2016! The Lucky Puppy site is already live, to give us a glimpse at what lies ahead. 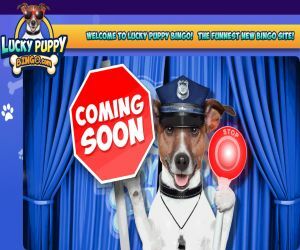 From what we can see, the fun-packed new site will be latest site to debut on the Cozy Games label and run on the Live Bingo Network. The splash screen welcomes you to centre stage, surrounded by a royal blue curtain. The lucky puppy patroller will be the star of the show, and will catch your attention with a neon-flashing Traffic Stop sign and ‘Coming Soon' sign. Pitched as the ‘funnest new bingo site' to launch for 2016, we're sure you can expect plenty of irresistible entertainment, fun-packed games and tempting chances to win! You can also experience the fun on your desktop and on the run on your mobile and tablet devices. The site will be the newest addition to the Live Bingo Network, so if it's anything like Landmark Bingo, you can expect hot bonuses and rewarding promotions, like a £15 no deposit bonus and a lucrative £50 welcome bonus. You can also expect to get lucky with an electrifying range of 75, 90, 80 and 30 ball bingo, plus Free games. The site should also feature a thrill-filled collection of popular slots like Fluffy Too and Straburst, casino and enticing progressive jackpot hits. Watch this space for the juicy launch details and the latest puppy patroller gossip!